Notes: Based on a manga series written by Yōzaburō Kanari or Seimaru Amagi (depending) and illustrated by Fumiya Satō, and serialized in Weekly Shōnen Magazine. 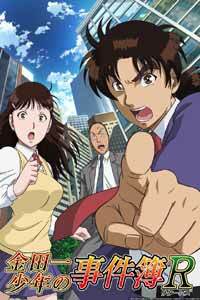 Hajime Kindaichi is the grandson of a famous detective, and while otherwise a rather lazy high school student, he has the talent for observation and passion to solve mysteries of his predecessor. With his friend Miyuki Nanase, he finds himself pitting his skills against one mystery after another. This is mostly a formula show, but at its best I didn't mind that at all. The general scheme goes something like this: a killer (sometimes killers), usually motivated by a grudge, engages in an often incredibly elaborate plan of murder that goes to great lengths to divert suspicion from the actual killer(s) (while often trying to throw it on some innocent.) Kindaichi's task is to spot the key clues necessary to penetrate this misdirection, and find the evidence that uniquely identifies the real killer(s). Making matters even more difficult is an arch-villain, the Puppeteer From Hell, who enjoys helping people stage "perfect" crimes. The individual stories run from single-episode to arcs of up to 5 episodes. (The murderers here, by the way, usually have legitimate grievances against their victims, but murder is still murder.) Like Miss Marple et al, Kindaichi doesn't seek out crimes, but sort of has them thrust into his life. His stories also end with the classic setup where all the suspects are gathered together, and Kindaichi then explains it all. He also has his favorite catch phrases, particularly "I swear it on my grandfather's name!" and "I've solved all the mysteries!" The first story arc (Eps. 1-4) winds up in Hong Kong, starting with Kindaichi's sorta-girlfriend Miyuki getting pressed into service as a substitute for a missing fashion model. It gives an early indication of a chronic problem with Kindaichi himself, namely his rather shabby treatment of Miyuki; in this arc he seems awfully cavalier about her safety. In later episodes he flirts with an "idol star" named Reika Hayama- and in one story arc, he does this right in front of Miyuki. Heck of a way to treat someone who obviously cares about you, pal. The murder plot, of course, is convoluted (though a later arc will take this to memorable heights), and seemed to not entirely make sense when I thought about it. Yes, when the killer finally confessed, I understood that person's motivation perfectly, but things end on a note of sentimentality and optimism that certainly seemed incongruent with the circumstances- especially since, I believe, China still has the death penalty. On the other hand, Episode 5 shows how amazing Kindaichi can be when on-task; he combines the persistence and youthful energy of Tintin with the keen perception of minute details, and ability to draw logical conclusions from them, of Sherlock Holmes. This episode is a pitch-perfect example, as Kindaichi is able to deduce, mainly just from physical appearance, the background (and deeds) of a total stranger. Remember that "mystery" segment in The Melancholy of Haruhi Suzumiya?- cast stranded on isolated island in mansion during storm, and locked-room murder occurs? The Ep. 6-9 arc of this show is that mystery, played straight (and with more than one victim.) I kicked myself on this one- of ALL people I should have been able to deduce the significance of the mansion's room numbers. (I wonder if Nicoletta, who in some ways has a background similar to mine, will figure it out?) Oh, by the way, something with a mass of a ton has a ton's worth of inertia, whether you're working against gravity or not; you can't lift a car at all, but due to inertia (plus frictional force) it's also difficult for one person to even push a car on a level plane. I think this would have been particularly noticeable to the person who would have been most affected by this fact in this story arc, but some of the show's gimmicks and contrivances are not entirely plausible. (Even when they're not, they're kind of fun to pick apart, though.) Also, while the perpetrator here had a similar motive to the one in the Hong Kong story, the treatment they're given in the end is rather different from what the one in the earlier story got. I guess sauce for the goose really IS different from sauce for the gander. Next (Eps. 10-14), since Kindaichi's grades are so awful, Miyuki has him go to a private academy that's billed as kind of a "tough love" school but ultimately turns out to be more like a gulag. There are several murders again, and the scheme used here to give the guilty party (or parties) alibi(s) has to be THE most Rube Goldberg-style contrivance ever attempted in the history of crime fiction. I'm honestly not sure whether or not I'm filled with ADMIRATION here, but it certainly left me speechless. The human tragedy behind it all was extremely well rendered, though. This is followed by a two-part story on an airliner (only notable for showcasing one of the "second banana" characters, Inspector Akechi.) Then we've two episodes from Kindaichi's middle-school days; the second one, involving a swimming pool "accident," is definitely the better of the two. The show closes with a three-episode story mainly notable for dealing with the Kindaichi/Miyuki relationship in a bit more detail. Oh, and there are some murders, as usual. And pirate heads. I may never be able to forget the pirate heads. Generally, the show has gorgeous background art and vivid coloration. Character design is a mixed bag; the line art itself is fine, but for the female faces especially there seems to be a limited palette of designs. The music has much the same "old-school" feel as the rest of the show (i.e., classic J-Pop), with my favorite song being the rocking ballad that serves as the closer for the first 14 episodes. Recommended Audience: The mature themes and violent subject matter are inappropriate for young children. There's some mild fanservice. Older teens and up.